To better promote and to continue improve the image of the HKHA Youth league, the P&D section would like to propose the Youth League Logo for teams to have on all their team shirts. An easy print-on logo will be provided by the P&D section for teams to iron it on the shirt. We would recommend all teams to iron it on the visible side of the right sleeve of their team shirt, if that space has been taken by other logos, the logo should be printed on the visible side of the left sleeve. An AI file of the printed logo will also be provided if teams wish to use alternative ways to print the logo on. Please note that the colour on the logo should not be altered and in the case of clashing with the base colour of the shirt, we suggest to first print the logo on a square white base. The youth hockey league has now been going on for two seasons. There has been an enormous turn out from the youngersters. This league is aimed at teenagers aged between eleven and sixteen. Hockey is the league is clean, competitive and good to watch. The players play with the full men's league rules and it is eleven a side. The league is set out so that there is a round robin follow ed by the top two teams playing a playoff for the cup. At the moment there are five teams in this league and for the past two seasons two different champions has emerged. This shows that the level of hockey is generally evenly spreadout. On the day of the finals the best player will be given the man of the match award. This league gives young hockey players a taste of what the men's league feels like and will aid them on their decision on whether or not to continue to that level. 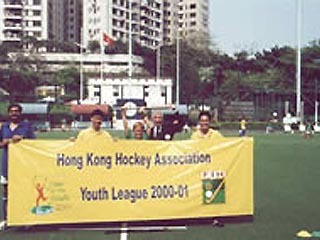 The finals was held on the 13th of May and was played at King's Park Hockey Ground. As this was also Mother's Day it attracted large crowds. The two finalists were the team from the Kowloon Cricket Club who contested the final against the youngsters from the Nav Bharat Club. This match was closely fought with both teams having opportunities but after full time both teams couldn't find the back of the net. So the game had to be decided on penalty flicks where Nav Bharat Club beat the Kowloon Cricket Club 3-1. 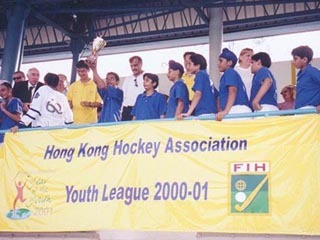 The cup was presented to Nav Bharat Club by Mr. Con Conway, The President of the Hong Kong Hockey Association.